Aim of Study: One of the new methods that have promising results is the use of cell-derived microvesicles (MVs) to kill tumor cells. Given that MVs contain apoptotic materials, genes, and proteins, they can interfere with the fate of adjacent cells. Materials and Methods: In the present study, after adipose tissue-derived mesenchymal stem cells (AT-MSCs) isolation and characterization, MVs were derived from AT-MSCs and then characterized morphologically by standard error of the mean and size determination by DLS, and after that, the influence of MVs on human breast cancer cells (MCF-7) was investigated by 3-(4,5-dimethylthiazol-2-yl)-2,5-diphenyltetrazolium assay and apoptosis-related gene expression. The raw data were analyzed in SPSS.17 software. 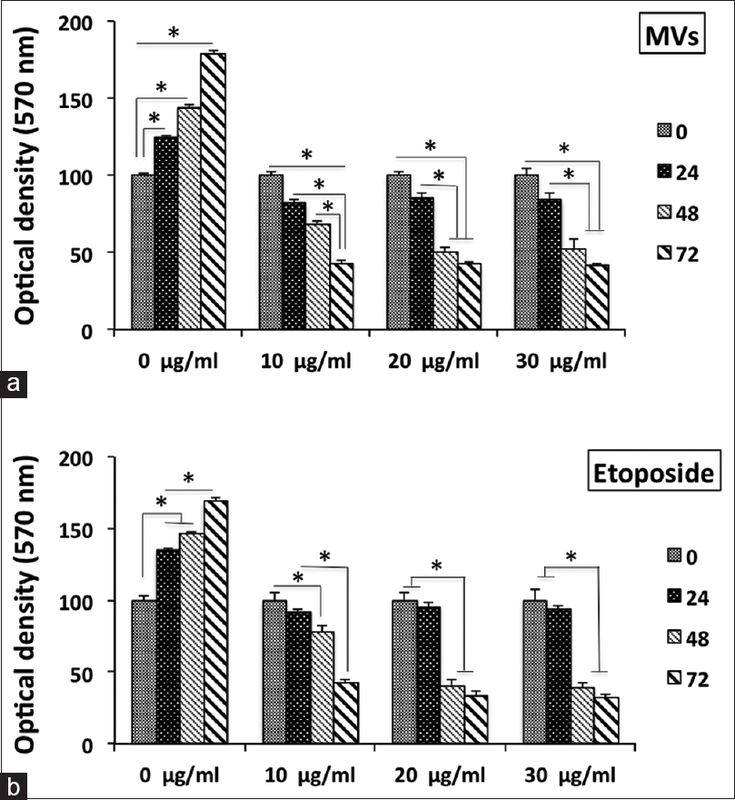 Results: The results indicated that MVs have a size range of 500–1500 nm, and the viability of MCF-7 was significantly decreased when treated by different concentrations of MVs and it was confirmed when apoptosis-related genes' expression level was measured by real-time reverse transcription polymerase chain reaction whereas demonstrated that apoptosis genes including Bax, P53, P21, and EP300 (2−ΔΔCT) and ΔCT values were expressed significantly in MCF-7 treated by MVs higher than those nontreated, and decrease of Bcl-2 expression level in MVs-treated MCF-7 was also significant as an antiapoptosis-related gene. Conclusions: Taking together, AT-MSC-derived MVs demonstrated anticancer or antitumoral properties on MCF-7 cells, and it could also be effective for other types of cancer cells. Cancer is one of the most important noncommunicable diseases that are currently affecting human beings. Cancer is the second most common cause of death in the world, with 8.8 million deaths worldwide. According to statistics released in 2018, 1,735,350 new cancerous patients and 609,640 deaths are occurred due to cancers in the United States. Breast cancer is the most commonly diagnosed cancer and is the fifth cause of cancer deaths in both men and women (571,000 in 2015) and the second cause of cancer death among women. Annually, about one million and a hundred thousand new cases of this disease are diagnosed, causing annual deaths of 500,000 people. In the United States, in 2018, 266,120 cases of breast cancer have been estimated, of which a total of 40,290 deaths have been reported. The age of the disease in developed countries is 40–60 years, while, unfortunately, the prevalence rate in Iran is 10 years younger and 40–30 years old. The prevalence of this disease in Asian women is somewhat lower than in the United States and Western Europe. Similarly, women in industrialized countries have a higher risk of infection than others, but Japan is an exception. Statistics and evidence have suggested a steady increase in the incidence of breast cancer since the mid-1940s. For example, in the United States, its prevalence rose from a ratio of 1 to 13 in 1970, from 1 to 11 in 1980, and from 1 to 8 (Available: http://www.breastcancer.org/symptoms/understand_bc/statistics). These MSC-derived exosomes and MVs may have some particular advantages such as fewer tendencies to initiate inherent and compromised immune responses for patient safety. These MVs can play an inhibitory role by proteins, mRNAs, and miRNAs. These MVs can also be content of inhibitors of cancer stem cell (CSC) signaling, siRNAs/miRNAs targeting oncoprotein and CSC signaling, proapoptotic proteins, and proteasome that help to killing of the cancerous cells. The content of MVs varies according to the cell type and can have different effects on other cells. However, more studies are needed to more clear presentation of these functions because these effects depend entirely on the type of cells that release MVs, the type of cancer cells, and the stage in which it is located. 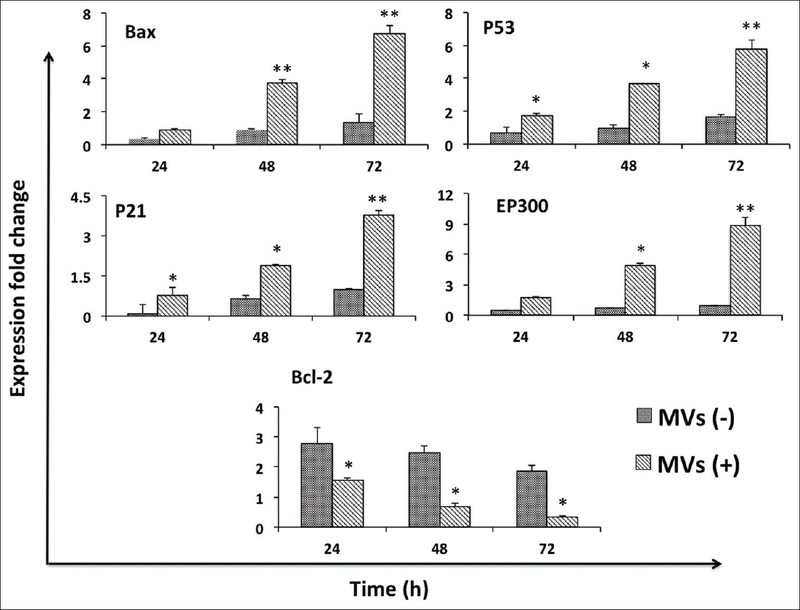 In this study, we have tried to investigate the effects of MVs secreted by human adipose-derived MSCs on the growth and proliferation rate of the human breast cancer cells. Fat tissues were aspirated during liposuction procedures from abdomens of five men donors with an average age of 35 years (Razi Clinic, Tehran, Iran) with informed consent, according to the medical ethics guidelines of Shahid Beheshti University of Medical Sciences, Tehran, Iran. MSCs were extracted from fat tissues, according to the protocol was previously reported. In brief, samples were transferred with Dulbecco's Modified Eagle's Medium (DMEM) supplemented with penicillin and streptomycin antibiotics and after that were washed three times with phosphate-buffered saline (PBS) content antibiotics while cutting them apart. Samples were incubated by 0.2% collagenase Type-I for a 30 min at 37°C while shaking slowly and then centrifuged at 1500 RPM for 15 min, and then supernatant was removed and cell pellet was suspended in the basal medium (DMEM supplemented with fetal bovine serum [FBS] 10% and antibiotics and antifungal) and transfer to the flasks. Culture media were exchanged every 2 days to remove nonadherent cells and cell's debris. After 4 days, cell density comes to 80%; cells were detached with 0.25% trypsin and subculture them to achieve a homogenous stem-cell numbers as adipose tissue-derived MSCs (AT-MSCs). To characterize the isolated cells, osteogenic and adipogenic differentiation potential of them was investigated at passage 3 according to the previously reported protocols. 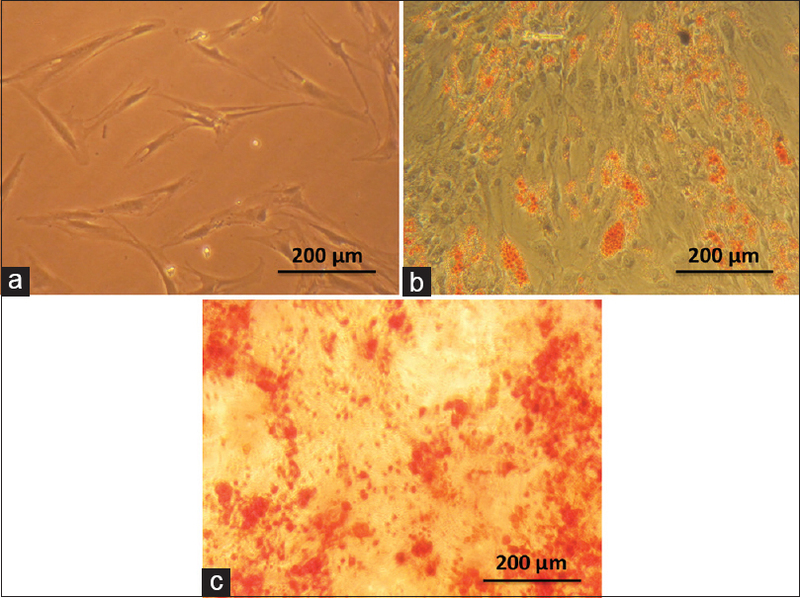 Stem cells were seeded with cell density of 2 × 104 cells per well at a 4-well plates under DMEM medium supplemented with 100 μM dexamethasone, 10 μM beta-glycerol phosphate, 50 μM ascorbic acid, and 10% FBS (all from Sigma-Aldrich, USA) for osteogenic differentiation and supplemented with 5 μL dexamethasone 1 μM, 5 μL insulin 1.7 μM, 5 μL indomethacin 200 μM, 5 μL isobutylmethylxanthine 500 μM, and FBS 10% (all from Sigma-Aldrich, USA) for adipogenic processes. Another 4-well plate was considered as a control group, which these cells cultured under basal media (DMEM supplemented with 10% FBS). Media were exchanged every 2 days and 14 days after seeding time, cells were fixed with paraformaldehyde 4% for 45 min at room temperature (RT) and then washed by cold PBS very slowly. Stem cells that differentiated into osteoblast, stained with alizarin red (Behnogen, Iran) for 10–15 min at RT, and those differentiated into adipocyte stained with Oil red (Merck, Germany) for 10 min at RT. Fixed control groups were also stained with alizarin red and oil red after 14 days. To MVs obtaining, first, the supernatants of several T-75 flasks with 80%–90% AT-MSCs at passage 3 were collected through centrifuge at 2000 rpm, 4°C for 10 min. Then, to eliminate apoptotic bodies and cell debris, the supernatant obtained from the previous step was centrifuged again at 10,000, 4°C for 20 min. After that, to achieve MVs pallet, the supernatant obtained from the previous step was centrifuged again at 60,000 g, 4°C for 1 h, and finally, the MVs pellets were washed in PBS by re-centrifuge at 60,000 g, 4°C for 1 h. MVs were stored at −70°C after aliquot in several microtubes, but protein concentration measurement was performed using freshly pellets using Bradford assay. To morphological evaluation, isolated MVs were fixed with 3.7% glutaraldehyde (Sigma Aldrich, St. Louis, MO) for 20 min. Then, samples were washed twice with PBS; the fixed MVs were dehydrated through a graded series of ethanol (10 min for every section, 50%, 60%, 70%, 80%, 90%, and 100%). When ethanol evaporated from samples, they were left to dry at RT for an overnight on the glass plates and then mounted on aluminum stubs. Samples were examined by a scanning electron microscope (S-4500; Hitachi, Tokyo, Japan) at an accelerating voltage of 20 KV after gold-palladium sputtering. To DLS and zeta potential determinations of MVs, Zetasizer nanoseries instrument (Malvern Nano-Zetasizer = 532 nm laser wavelength) was used according to the previously reported protocol. Scattering intensity distribution (z-average) was considered for MVs size and then nanoparticle-tracking analysis was performed with a NanoSight LM10 instrument equipped with the NTA 2.0 analytical software (NanoSight, Wiltshire, UK) for determining the size of MVs. These two experiments were performed after diluted MVs in PBS (1:1000) and all samples were analyzed as triplicate experiments. Total protein concentration content of extracted MVs was performed using a Bradford protein assay kit (Merck) according to manufacture's protocol. In brief, after preparing a concentration gradient of bovine serum albumin in a 96-well plate, the PBS-suspended MVs were also prepared as triplicate in that plate. Then, 200 μl of a Bradford reagent was added to the each well, and a micro-plate reader at 595 nm (BioTek Instruments, Winooski, VT, USA) was used for absorbance measurement of the samples. Finally, protein concentration was calculated through a standard curve and its line equation. In this project, MCF-7 cell line was used as the most widely used human breast cancer cell line. These cells are isolated from human breast squamous adenoma, adherent with a doubling time of 38 h. The cell vial was purchased in freezing form from Pasteur cell bank (Tehran, Iran) and after thawing in RPMI supplemented with 10% FBS and 1% penicillin and streptomycin antibiotics, sub-cultured several times when received to 90% confluence. Cell viability was examined using 3-(4,5-dimethylthiazol-2-yl) -2,5-diphenyltetrazolium bromide (MTT) test to obtain a proper concentration of the MVs, which has a highest inhibitory effect on the MCF-7 cells' growth, as well as no inhibitory effect on AT-MSCs as a control group during 96 h. In addition, it should be noted that Etoposide was considered as a positive control as a common anticancer drug. MTT (10 μl) was added to the cells after 24, 48, 72, and 96 h, while cells were treated with the different concentrations of the MVs and Etoposide (0, 5, 10, 20, 30, 40, and 50 μg/ml) and the cells were incubated for 4 h at 37°C. After that, supernatant was removed and 100 μl of dimethyl sulfoxide was added to the wells for Formazan dissolving and then absorbance was read using a microplate reader at 570 nm (BioTek Instruments, Winooski, VT, USA). The median lethal dose (LC50) was considered for MVs and Etoposide that giving 50% cytotoxicity. MCF-7 cells were cultured under the selected MVs concentration (20 μg/ml) and under basal media as a control group for 3 days. After that, expression level of the important apoptosis gene markers including P53, P21, EP300, Bcl-2, and β-actin as an endogenous control was measured using real-time reverse transcription polymerase chain reaction (RT-PCR) on days 1, 2, and 3. First, RNeasy kit (Qiagen, Germantown, MD, USA) was used for total RNA extraction according to the manufacturer's protocol. After that, cDNA was synthesized using a RevertAid First Strand cDNA synthesis kit (Fermentas, Burlington, ON, Canada). PCR parameters included denaturation at 95°C for 4 min, then 35 cycles at 95°C for 15 s, annealing at 60°C for 30 s, and elongation at 72°C for 30 s. Real-time RT-PCR was performed using SYBR Premix Ex Taq (TaKaRa Bio Inc., Otsu, Shiga, Japan). Rotor Gene 6000 (Corbett, Concorde, NSW, Australia) was used for the measurement of the gene expression levels. Primer sequences are demonstrated in [Table 1]. Experiments were carried out three times, and data are shown as mean ± standard deviation Real-time RT-PCR results were analyzed by REST 2009 software (Qiagen, Hilden, Germany) and the one-way analysis of variance using SPSS software (SPSS version 19, Chicago, IL, USA) was used for evaluation of significance, whereas 0.05 was considered as P value for statistical significance. Isolated stem cells were characterized first by morphologically with their spindle fibroblast-like shape at passage 2 [Figure 1]a and then by osteogenic and adipogenic differentiation potentials' investigation. Oil drop vesicles resulting by isolated stem cell's adipogenic differentiation were detected by oil-red staining in red color [Figure 1]b and deposited calcium due to osteogenic differentiation process was stained by alizarin red-S [Figure 1]c.
Extracted MVs from AT-MSCs were characterized morphologically by standard error of the mean (SEM) [Figure 2]a and then the size of MVs was measured by DLS and result was showed that MVs size were with diameters of 500–1500 nanometer [Figure 2]b. AT-MSCs extracted MVs zeta potential was strongly negative − 60 ± 18 mV. Obtained MCF-7 cell line, as a routine human breast cancer cell line, was cultured and expanded and depicted in [Figure 2]c. MTT assay was done to investigate viability of MCF-7 cells when treated by different concentrations of the extracted MVs during 72 h, and results were showed that cell viability was decreased during 3 days in all treated groups (10, 20, and 30 μg/ml MVs) compared to the control group (0 μg/ml MVs) with increasing pattern during 3 days [Figure 3]a. MCF-7 was also treated by Etoposide as a common chemo-drug for cancer therapy and its survival was analyzed using MTT [Figure 3]b. To more evaluation of which mechanism was used by MVs to decrease viability of the MCF-7 cells, four apoptotic genes and one antiapoptotic gene were investigated by real-time RT-PCR in MCF-7 cells were treated by 20 μg/ml MVs on all 3 days [Figure 4]. Expression level of the Bax, P53, P21, and EP300 genes was significantly increased 48 and 72 h after MCF-7 cells' treatment by MVs in comparison with nontreated cells, although P53 and P21 were also significantly increased in treated groups 24 h after treatment compared to the control. Bcl gene expression as an antiapoptotic factor was showed a decreasing pattern during the culture process for both treated and nontreated groups, while this decrease was significant in treated group compared to the nontreated group. The aim of this study was investigating the anticancer properties of the human AT-MSCs-derived MVs on the one of the most famous human breast cancer cell lines, MCF-7. We successfully extracted MVs and characterized by SEM, DLS, surface negative potential, and protein content using Bradford assay. Since, two most important items that are very critical during cell's lifespan (growth and proliferation) are cell-to-cell and cell-to-surface communications. Membrane activities including embedding vesicles that named MVs have an important role in cell-to-cell communications while mediate information exchange between cells since MVs content genetic materials such as miRNAs and mRNAs that can epigenetically reprogram their neighbor cells., Several studies were reported MVs secreted by MSCs derived from different sources that can exclude positive and negative responses from their neighbor cells., In addition, during the last decades, adult stem cells particularly MSCs have a critical role in the repair and regeneration of the injured tissues in the body that this role is due to migration capability of the MSCs to the injured site that named homing ability. However, it is not completely clear that when MSCs migrate and incorporated to the tumor site, it has inhibitory effects on tumor progression or it has any enhancing effect, while it could be found several papers in all two characteristics of the MSCs in literature. Fonsato et al. examined the role of MVs derived from human adult liver stem cells (HLSC-MVs) in gastrointestinal cancers through in vitro and in vivo studies. They in vitro results were showed that HeoG2 hepatoma and primary hepatocellular carcinoma cell's growth was inhibited when treated by HLSC-MVs and their in vivo results were also confirmed anticancer properties of the HLSC-MVs when injected to the ectopic tumors developed in SCID mice. In another study, Bruno et al. were observed that MVs isolated from bone marrow MSCs would have a protective effect against acute tubular damage. According to the results of microarray, they concluded that this effect is due to the presence of RNAs in MVs. Our results were also showed that MVs extracted from AT-MSCs have a great anticancer property on breast cancer cells according to the MTT results and confirmed by upregulation of the apoptotic gene markers through real-time RT-PCR analysis. It has been demonstrated that MSCs derived MVs has an anticancer effect on various tumor cells, for example, Wu et al. investigated anticancer effects of MVs extracted from human umbilical cord Wharton's jelly-derived MSCs on the growth of the T24 cell line as a bladder tumor cell and their results revealed that cells growth markedly reduced by MVs. The cell growth pattern was studied at 24, 48, and 72 h after culture under the presence of MVs. T24 cells were also injected subcutaneously to the mice for ectopic in vivo evaluation of the antitumor effects of MVs and results demonstrated that tumor size was very small when T24 cells injected with MVs in comparison with injected with MSCs or alone. These inhibitory effects were resulted the protein kinase Akt and caspase-3 during apoptotic pathway activation. There are several ways to use MVs for cancer treatment. For example, it can be used as a natural carrier for anticancer drugs, and on the other hand, miRNAs and surface proteins present in exosomes and MVs can specifically induce apoptosis or inhibit cancer signals in cancerous cells. In addition, this kind of treatment has no ethical problems and is also a natural base and has no side effects such as chemotherapy drugs. According to the results, it could be concluded that MVs are involved in the various physiological and pathophysiological processes in the body, which is depended on the type of source cell and target cell and there will be a wide range of implications including escape from the immune system, angiogenesis and anti-angiogenesis, metastasis and anti-metastasis, preservation of stem cell plasticity, and phenotypic regulation. Lin CH, Liau JY, Lu YS, Huang CS, Lee WC, Kuo KT, et al. Molecular subtypes of breast cancer emerging in young women in Taiwan: Evidence for more than just Westernization as a reason for the disease in Asia. Cancer Epidemiol Biomarkers Prev 2009;18:1807-14. Miller KD, Siegel RL, Lin CC, Mariotto AB, Kramer JL, Rowland JH, et al. Cancer treatment and survivorship statistics, 2016. CA Cancer J Clin 2016;66:271-89. Entezari M, Majd A, Falahian F, Mehrabian S, Hashemi M, Lajimi AA. Antimutagenicity and anticancer effects of Citrus medica fruit juice. Acta Med Iran 2009;47:373-7. Cai Y, Luo Q, Sun M, Corke H. Antioxidant activity and phenolic compounds of 112 traditional Chinese medicinal plants associated with anticancer. Life Sci 2004;74:2157-84. Golchin A, Hosseinzadeh S, Ardeshirylajimi A. The exosomes released from different cell types and their effects in wound healing. J Cell Biochem 2018;119:5043-52. Ohno S, Takanashi M, Sudo K, Ueda S, Ishikawa A, Matsuyama N, et al. Systemically injected exosomes targeted to EGFR deliver antitumor microRNA to breast cancer cells. Mol Ther 2013;21:185-91. Lv LH, Wan YL, Lin Y, Zhang W, Yang M, Li GL, et al. Anticancer drugs cause release of exosomes with heat shock proteins from human hepatocellular carcinoma cells that elicit effective natural killer cell antitumor responses in vitro. J Biol Chem 2012;287:15874-85. Simons M, Raposo G. Exosomes – Vesicular carriers for intercellular communication. Curr Opin Cell Biol 2009;21:575-81. Yu B, Zhang X, Li X. Exosomes derived from mesenchymal stem cells. Int J Mol Sci 2014;15:4142-57. Camussi G, Deregibus MC, Bruno S, Cantaluppi V, Biancone L. Exosomes/microvesicles as a mechanism of cell-to-cell communication. Kidney Int 2010;78:838-48. Bruno S, Collino F, Deregibus MC, Grange C, Tetta C, Camussi G, et al. Microvesicles derived from human bone marrow mesenchymal stem cells inhibit tumor growth. Stem Cells Dev 2013;22:758-71. Ardeshirylajimi A, Rafeie F, Zandi-Karimi A, Jaffarabadi GA, Mohammadi-Sangcheshmeh A, Samiei R, et al. Fat harvesting site is an important determinant of proliferation and pluripotency of adipose-derived stem cells. Biologicals 2016;44:12-8. Piran M, Enderami SE, Piran M, Sedeh HS, Seyedjafari E, Ardeshirylajimi A, et al. Insulin producing cells generation by overexpression of miR-375 in adipose-derived mesenchymal stem cells from diabetic patients. Biologicals 2017;46:23-8. Sokolova V, Ludwig AK, Hornung S, Rotan O, Horn PA, Epple M, et al. 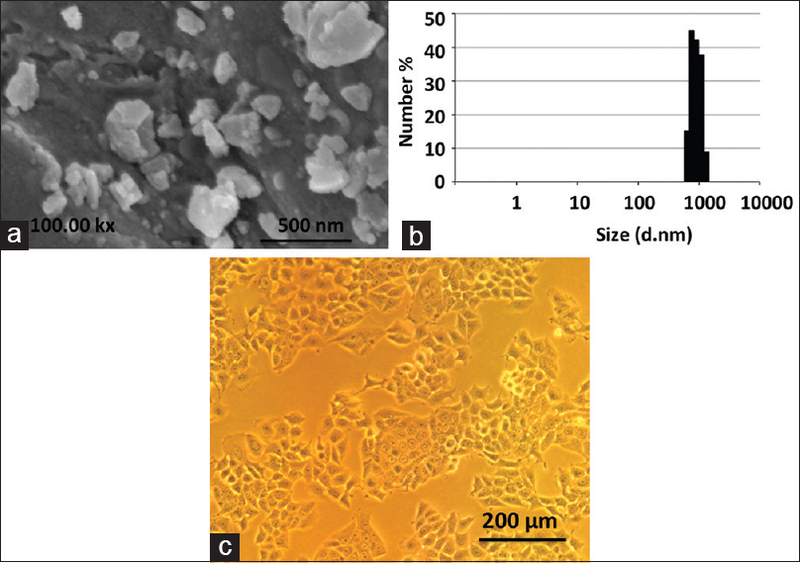 Characterisation of exosomes derived from human cells by nanoparticle tracking analysis and scanning electron microscopy. Colloids Surf B Biointerfaces 2011;87:146-50. Camussi G, Deregibus MC, Bruno S, Grange C, Fonsato V, Tetta C, et al. Exosome/microvesicle-mediated epigenetic reprogramming of cells. Am J Cancer Res 2011;1:98-110. Collino F, Deregibus MC, Bruno S, Sterpone L, Aghemo G, Viltono L, et al. Microvesicles derived from adult human bone marrow and tissue specific mesenchymal stem cells shuttle selected pattern of miRNAs. PLoS One 2010;5:e11803. Tetta C, Bruno S, Fonsato V, Deregibus MC, Camussi G. The role of microvesicles in tissue repair. Organogenesis 2011;7:105-15. Wu Y, Zhao RC, Tredget EE. Concise review: Bone marrow-derived stem/progenitor cells in cutaneous repair and regeneration. Stem Cells 2010;28:905-15. Fonsato V, Collino F, Herrera MB, Cavallari C, Deregibus MC, Cisterna B, et al. Human liver stem cell-derived microvesicles inhibit hepatoma growth in SCID mice by delivering antitumor microRNAs. Stem Cells 2012;30:1985-98. Bruno S, Grange C, Deregibus MC, Calogero RA, Saviozzi S, Collino F, et al. Mesenchymal stem cell-derived microvesicles protect against acute tubular injury. J Am Soc Nephrol 2009;20:1053-67. Wu S, Ju GQ, Du T, Zhu YJ, Liu GH. Microvesicles derived from human umbilical cord Wharton's jelly mesenchymal stem cells attenuate bladder tumor cell growth in vitro and in vivo. PLoS One 2013;8:e61366.